I showed in Mast ground rework the use of a Cadweld Oneshot Plus thermite weld of the ground conductor to the ground rod. Responding to reader interest, I have made a little video demonstrating the process. Above is a pic of the demonstration piece with crucible and slag broken away. Last time I used Cadwelds is quite a while back, and it was the reusable graphite mould with thermite powder (coarse first, then fine on top) initiated by the familiar pistol flint gas lighter. I often see online ham debates over the best type of gas torch for initiating these things… and the answer is simply none, the flint lighter is the most effective means (the sparks off ferrocerium burn burn at around 3000°). Now this system could be a bit of a challenge in very windy conditions as the trail of fines that one puts on top of the mould to catch the hot flint can blow away (and yes, that is the same reason that gas torches don’t work very well… they not only blow the powder away, but they are lower temperature than a flint). 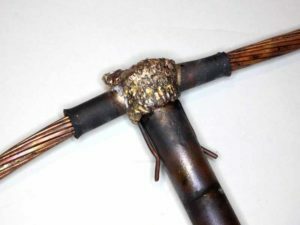 For this project, I explore two newer forms of the Cadweld, firstly a single use mould, and secondly an electric igniter. The single use mould is a little more expensive per weld than the reusable mould, but you don’t need to flame dry it before use (they are hygroscopic) or clean it after use, and it is faster in that you can be setting up welds and initiating while previous ones are still cooling. Of course, if you only want to do a handful of welds, the reusable mould at several hundred dollars is expensive. The electric igniter is expensive (though I bought a used one is good condition on eBay for about $50), but it is convenient, safer, less prone to powder spillage, and not affected by wind. Above is the video on Youtube, it is just under 3min and about 22MB. The camera is positioned so that you can see the weld slug glow and can observe how long it takes to cool below red hot. Note also the colour change on the 35mm^2 copper cables as they heat up. I did have some issues with deformation of the plug housing and creep of the cable jacket on the igniter, it needs a cable clamp. As a temporary measure I have used a nylon zip tie and served the connector body over with self amalgamating Silicone Rescue Tape. More on that in another article. Overall I give this a thumbs up, it is better in a lot of ways to the original system.